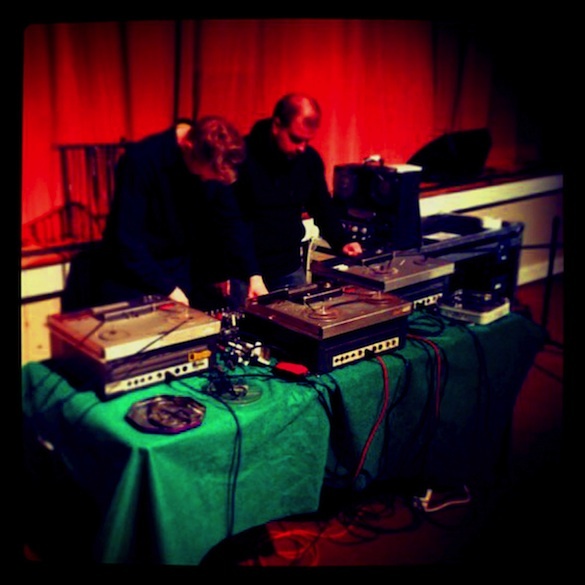 Howlround are the duo of Robin The Fog and Chris Weaver who create recordings and performances entirely from manipulating natural acoustic sounds on a quartet of vintage reel-to-reel tape machines – with additional reverb or electronic effects strictly forbidden. This recording documents their first ever live performance at the Brighthelm Centre as part of the Resonance FM stage at the Great Escape Festival, Brighton, 18th May 2013. It was the first time these delicate, bulky, unpredictable machines had ever left the studio – a complete step into the unknown – and therefore something of an occasion. This recording is presented without edits or overdubs, just the sound of four machines, two people and a huge tangle of quarter-inch tape, looping and snarling precariously around the venue. Click here for Howlround‘s website.